Rain will always catch our attention It can be heard in the pitter patter of raindrops, or the pummeling of a heavy shower. Dew, on the other hand, is silent. It does not draw attention to itself at all. It can be seen as a more humble, unassuming version of rain; never causing damage, gentle, nourishing and dependable. 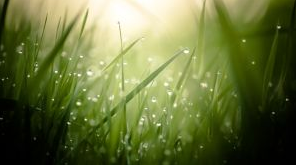 Dew often goes unnoticed, and we need to make an effort to become aware of this subtle gift from God that speaks of his steadfast love – his mercies that come new every morning. It sustains, bringing gentle nourishment to the earth. It is a refreshment, a gift and a message from heaven, a source of life. The womb of the morning can refer to the very break of morning, when dew appears. It speaks of freshness; the strength of the early stages of our day’s journey. Whether or not we pay attention to it, the dew is always there. However long we may have ignored it or overlooked its presence, like the unconditional love of God, it appears day after day, no questions asked. Have we overlooked the presence of dew?